According to its opening titles, Dynamite Chicken is "A contemporary probe and commentary on the mores and maladies of our age, with schtick, bits, pieces, girls, some hamburger, a little hair, a lady, some fellas, some religious stuff, and a lot of other things." That's as good a way as any to describe this chaotic, rambling montage featuring contributions from many of the movers and shakers of the peace and love generation of the late 1960s. The film opens with comedian Richard Pryor talking to the camera in an urban schoolyard. He provides the film with whatever focus it has, popping up every few minutes to talk about some topic or other. 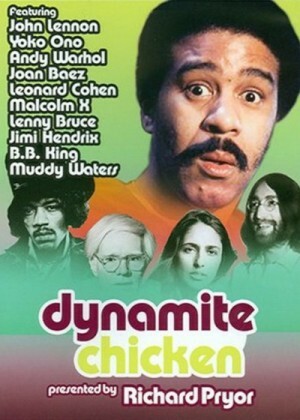 Dynamite Chicken features interviews, skits by the comedy troupe the Ace Trucking Company, poems, man on the street interviews, a lot of old film clips, and even more photographs, all edited together at such a breakneck pace that it's hard to keep your mind focused in any one direction for very long. Among those who manage to make themselves heard above the din: Sha Na Na perform music from the 1950s; Paul Krassner talks about the different kinds of violence and other political issues; Al Goldstein and Jim Buckley discuss their then-new magazine Screw; Michael O'Donoghue reads a funny bit about a stripping nun; Tuli Kupferberg performs a bit of guerrilla theater with his group, the Revolting Theater; Marshall Efron applies a policeman's truncheon to a melon to show what can happen to a protester's head; John Lennon and Yoko Ono explain the point of their infamous "bed-in." Also seen, but to less clear purpose, are Andy Warhol, Ondine, Ron Carey, Joan Baez, Peter Max, and Al Kooper.